Like many people, I’ve spotted or spoke to different movie or TV stars. Sometimes I actually got to say hello and exchanged a few words. And sometimes my words, spoken in astonishment, were the wrong ones. One of the first stars I met was Lynda Carter who played Wonder Woman. And one of the people she was with, to my astonishment, was a character on The Six Million Dollar Man. I loved both shows but I was so young that, from what I remember, I was deeply confused as to why they were together and why they were in “reality” and not on TV. Since they were a part of a charity tennis event in Miami where my grandmother had a condominium, my grandmother got me in to see them. She snapped a picture of the stars who look back at the camera with big smiles. I suppose I was too astonished to even get in the photo and maybe their smiles reflect this. I’m not sure. I also spotted and even spoke to stars in Manhattan. When I was a little boy I remember spotting Dianne Keaton as she called for a taxi. And I met Vincent Price in the Ritz Carlton. I was confused. I didn’t know whether I should talk about his horror films (I had only seen clips of them and had seen him as a host for reruns of Horror Theater) or about his work with Michael Jackson. Not knowing what to say, I opted for Michael Jackson and said I loved his voice over for the “Thriller” video. I liked his work but I wasn’t so besides myself that I couldn’t speak. Nonetheless, I was trembling with joy. But a few years ago, I was proven wrong. Driving between New York City and Upstate New York, I ran into James Gandolfini in the oddest of places, a bathroom off of the New York State Thruway. 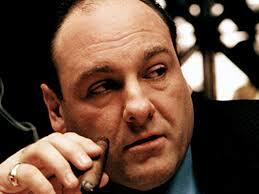 As it happens, I was at a urinal when Gandolfini pulled up to the urinal next to me. Since I loved the Sopranos, I was besides myself. And I had a schlemiel moment (or rather, encounter) which was an admixture of astonishment and the uncanny. At that moment I thought it would be too odd to say anything, so I devised a plan to act normal and wait for him to leave. After he left the bathroom, I would say hello and ask him for his autograph. After he finished at the stall, I couldn’t help but notice that he didn’t “shake” at the end of going to the bathroom like most people do. Instead, he moved his body up and down in front of the urinal. It looked like a dance move. As I tried to reconcile this methodology with my childhood training and observations of others growing up (as to how one should “shake” at a urinal) I noticed him leaving. I ran up to him as he left the bathroom and blurted: “Wow! James Gandolfini, Can I have your autograph? I’m the guy who peed next to you!” Although he gets asked for autographs quite often, this request was different. I could tell by the look he gave me that I had said something or done something in such a way that was inappropriate. But the look itself was worth it. I felt no shame. And although, in retrospect, I know that I had momentarily become-a-schlemiel by not recognizing how absent-minded my request was, I loved his gaze. It effaced the line between reality and The Sopranos. This was my schlemiel-encounter with James Gandolfini may he rest in peace.